Section Title – This shortcode was used to display section-title into various style. 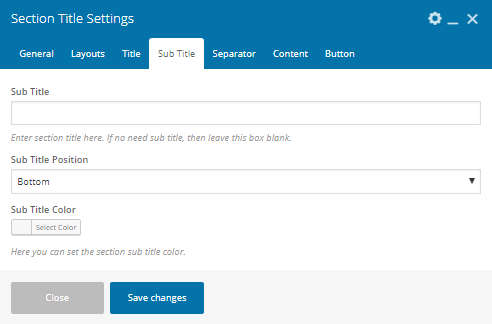 Title Prefix – Enter section title prefix. If no need title prefix, then leave this box blank. Title Suffix– Enter section title suffix. If no need title suffix, then leave this box blank. Text Align – Here You can Change text Alignment. Font Size – Here you can set the font size for the section title. Line Height– Here you can set the line height for the section title. Title Margin – Here you can modify the margin size. Subtitle – Enter section title here. If no need subtitle, then leave this box blank. 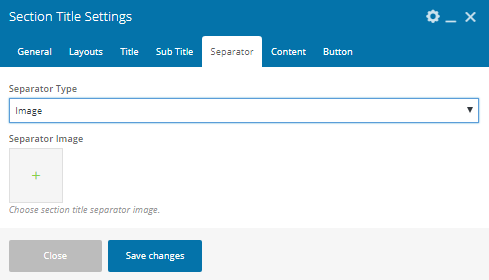 Subtitle Position – Here you can change the subtitle position top or bottom. Subtitle Color – Here you can change the subtitle color. Separator Type – Here you can change the separator type (Image or Border).